Varian Medical Systems focuses energy on saving lives by equipping the world with advanced technology for fighting cancer and for X-ray imaging. The company is the world's leading manufacturer of medical devices and software for treating cancer and other medical conditions with radiotherapy, radiosurgery, proton therapy, and brachytherapy. 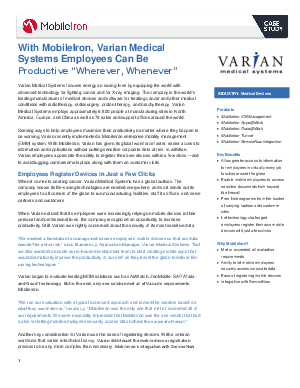 Varian Medical Systems employs approximately 6,800 people at manufacturing sites in North America, Europe, and China as well as 70 sales and support offices around the world.